Actually, if truth be told, I don’t really “get” fashion in general. Its bizarre – ugly things suddenly get declared ‘not ugly’ for the next season, after which, they’re placed back in the ugly box and that’s enough of that. But top knots, for some reason, seem to still be sticking around. All around Shoreditch, I keep seeing these uber trendy fashionista types wearing black cloth sacks (I think they’re meant to be dresses) and these strange knots on top of their heads. Ladies, what is the attraction? It is literally a ball of hair on the top of your head. This week, it has been baking hot in London, and so the other night I pulled all of my hair up into a knot on my head. My boyfriend took one look at me, laughed and then grabbed the knot, saying it looked like a doorknob. To be honest, there’s plenty of ‘fashiony’ things that I just don’t get. I’m pretty sure I could never be cool. And I’m entirely fine with that. I am with you 100% on this. When topknots started popping up a few years ago, I was baffled. I assumed the trend would die quickly, but I was wrong, so the bafflement continues. One of the newer trends that’s puzzling to me is how popular Birkenstock sandals are. I’m neutral on them, personally, but I get the rages whem I see people wearing things that, just last year, they wouldn’t have been caught dead in. Now that some arbiter of “taste” has declared them fashionable, thousands of dipshits have run out to buy a pair, and now they’re everywhere because it’s been deemed hot. I think it illustrates a lack of ability to think for one’s self; that’s what irks. 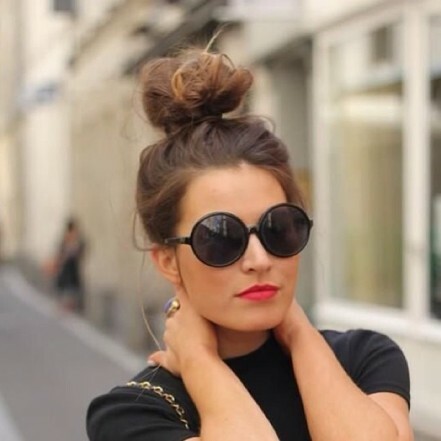 It seems that society is too afraid to inform top knot wearers that the ratty lump that sits atop their heads makes them look highly unattractive and painfully vapid. Beyond stupid.